Lyon Vastia (also known as Reitei Lyon) is a character from Fairy Tail. 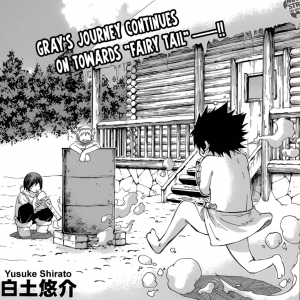 During his childhood training under Ur, he lived in at her log cabin in a snowy region which had Hinoki Bathtub inside and an Oil Drum outside which he would take Baths in both of them with Gray Fullbuster. Flashback of Lyon taking a bath with Gray in Ur's hinoki tub. In a flashback of his childhood training under Ur, one of the panels during a montage of his training and home life together shows him taking a Bath in a Hinoki Bathtub and Bathtub Sharing with Gray Fullbuster. Just like in the manga, a flashback of Lyon and Gray Fullbuster's childhood training under Ur shows a moment of them taking a Bath together in Ur's Hinoki Bathtub. Though unlike the manga, the bath was changed to a Cold Bath filled with ice where it is shown as a method of their training rather than just a regular bath. Lyon's facial expression has been changed as well, where as in the manga he had a serious look on his face here in the anime, he is shown with a smile on his face and hands behind his back. Lyon bathing in an oil drum. On the cover, Lyon is seen wearing a Wash Cloth on his head and Edge Leaning in an Oil Drum Bath outside in the snow that is being heated up by Ur while Gray Fullbuster who is wearing a Towel is seen freezing running over to it to join him. 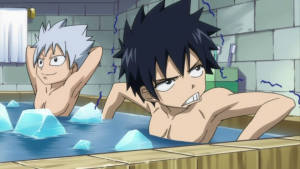 Both Lyon and Gray Fullbuster are the very first two male characters to have a Bath scene in any Hiro Mashima work. Lyon and Gray are the only two characters in any Hiro Mashima work to be shown bathing in a Hinoki Bathtub. Lyon is the first character in the series to have a bathing scene who wasn't a member of the Fairy Tail guild. This page was last modified on 26 November 2017, at 11:37.